Only 25 percent of all Michigan educators—and just 20 percent of teachers—would recommend a career in education to a young person they know, according to results from Launch Michigan’s 2019 Statewide Educator Survey. About 12 percent of nearly 17,000 educators who completed the online survey in February say they will exit the profession in the next two to three years—in addition to another 10 percent preparing to retire. Large class sizes, constraints on professional autonomy, and lack of appreciation most influence people’s desire to leave. Launch Michigan conducted the survey to inform its efforts to improve education in the state. MEA President Paula Herbart is a co-chair of the diverse group of education, labor, business, philanthropy and civic leaders attempting to find consensus for change. Survey respondents included teachers, administrators, paraprofessionals, counselors, media specialists, other professional ancillary staff, and education support professionals such as custodians, lunch monitors, and secretaries. After many years of declining state funding, educators see many priorities for improvement. The top three include reducing class sizes, increasing access to quality pre-school, and providing more funding to areas with the greatest student need. Drill down into the survey’s findings, and it’s easy to see why educators are unhappy, even though a majority report neutral or positive perceptions of the climate at their own school. Too much is invested in state standardized testing. Only one in five educators says the information received from state assessments is worth the cost in time and effort. One in four administrators feels the same way. Asked about the M-STEP in particular, twice as many educators say it is not useful as say it is useful—and among administrators that ratio is three-to-one. Professional development opportunities get poor marks. Just 43 percent of educators report receiving professional learning suggestions tailored to them. A majority called for better quality and quantity of professional development offerings across the board, with larger needs reported for training to meet the needs of all learners and to address behavioral and socio-emotional development issues. Elementary reading mandates have been unsupported. One in four say their school district is not prepared to provide supports to students retained under the third grade reading law. Only one in five believe their district is ready with “substantial” support. Among educators who work in urban districts—particularly those with high poverty and low per-pupil spending—40 percent say their districts are not prepared to address additional state mandates regarding retention of students next school year. 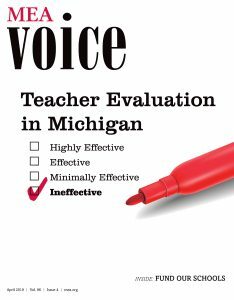 The evaluation system for educators is unfair and unhelpful. Fewer than half believe in the fairness of tools used to assess their job performance, and just 30 percent of teachers said the new evaluation system adopted in 2015 has helped student learning. The full results of the survey can be read at launchmichigan.org/news.